Monteverde is located in the Tilaran hills, and is a perfect example of Costa Rica’s excellent cloud forests. In fact, it is a nature reserve where ecotourism is a popular activity, and it’s officially known as the Monteverde Biological Reserve. The forest is known for its exquisite tropical biodiversity. 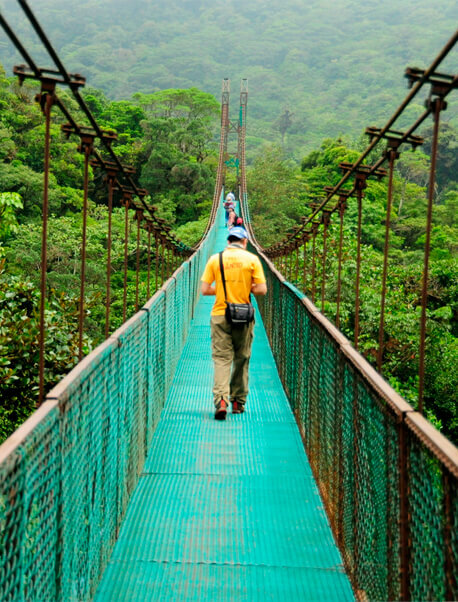 Monteverde has been recognized by Costa Ricans as one of Costa Rica’s Seven Wonders in a popular vote carried out by one of the country’s media sources. Also, in Newsweek’s Top 100, this location is classified as #14 in the Americas, and National Geographic has called it a “crown jewel”. It is a place of cloud forests and coffee plantations, monkeys, mist, and friendly locals. The town of Santa Elena is small and quaint, filled with tasty restaurants and folksy artisan shops, while the nearby rainforest hosts a remarkable amount of biodiversity. One difference between this destination and many others in Costa Rica that mix natural beauty with a friendly social atmosphere including nightlife, is that Monteverde is known for its peace and quiet. Here, the focus is on a personal connection with the mountain. It’s emblematic of a pure love for nature.